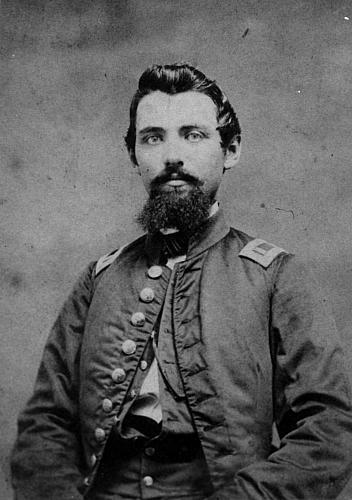 One of the earliest available photographs of Joseph Carl Herkner at age twenty-one shows him in his uniform as a member of the Grand Rapids Greys. Originally called the Cadets, they were a group of boys organized in May 1861, that soon changed their name. Several members of the Greys enlisted in the regular service in September of that year. Herkner was one of the first to enlist as 1st Lt. in Company D, the First Regiment Michigan Engineers and Mechanics. The regiment trained at Camp Owen in Marshall, and left Michigan in December of 1861 with just over one-thousand men. They proceeded to Louisville, Kentucky, where they reported to General Buell, commander of the Army of the Ohio. Herkner's company reported to General Thomas at Lebanon, Kentucky, and in January of 1862 participated in the Battle of Mill Springs. They went with Buell's Army of the Ohio to Shiloh, Mississippi, building several bridges on the way. From January 1863 until the end of June the regiment was located between Nashville and Murfreesboro to the southeast. During this time they built bridges, magazines, buildings for commissary, quartermaster and ordnance stores, and repaired and re-laid a large amount of railroad track. At the end of June the regiment moved south with the army from Murfreesboro in the advance on Chattanooga. They were engaged in repairing the railroad from Murfreesboro to Bridgeport, Alabama, just across the border, and building bridges. 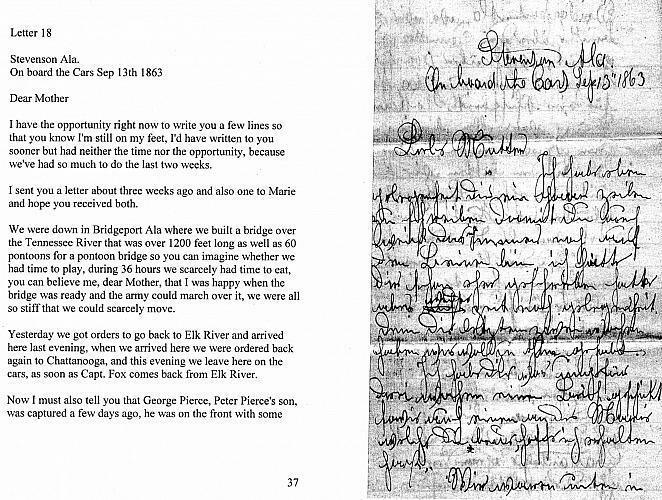 Joseph's letter to his mother, written on the train as they returned to Tennessee, describes their efforts at Bridgeport. Herkner at some point had requested that his mother send him a guitar which she provided, but we don’t know how she sent it to him. 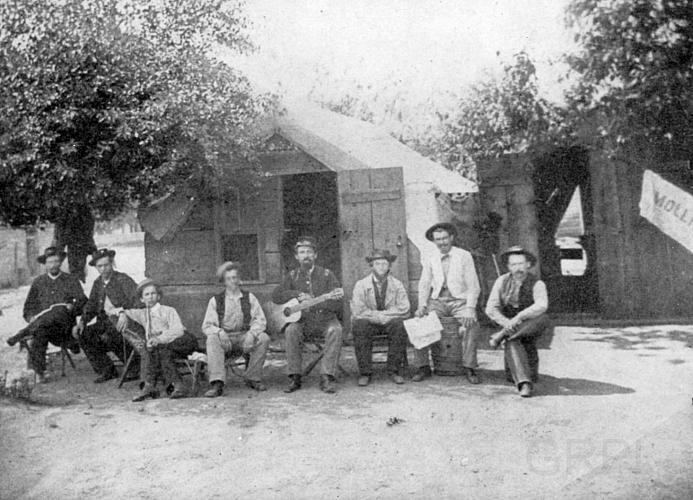 He is shown here with his guitar and members of the "Music Club" near Chattanooga as he relaxes from railroad mending and bridge building. 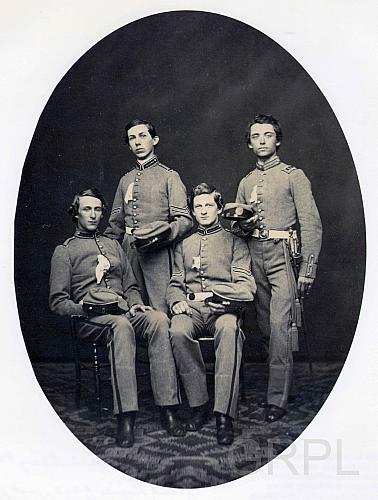 Left to right the members are: Lt. Francis D. Adams, Lt. Elias H. Jewell, Lt. George C. Williams, Corp. James H. Godfrey, Capt. 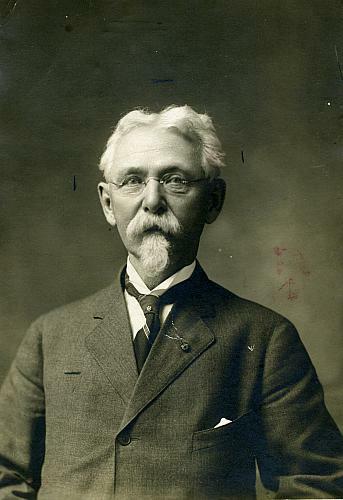 Joseph C. Herkner, unknown, ? 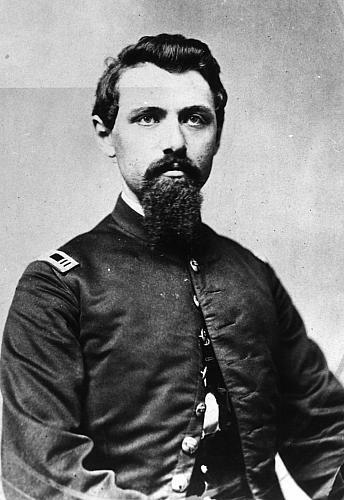 Tinkham, Field Lt. Russel K. Strickland. In February of 1864 Herkner was made Captain of Company D. By November of that year the regiment was in Atlanta tearing up the railroads leading into the city and destroying anything that might be of use to the enemy. As they marched toward Savannah they were employed in building "corduroy" roads and destroying the railroads. The regiment was mustered out at Nashville in September of 1865. After the war Joseph married Clara Calkins, daughter of Charles Philo Calkins. He resumed his career and worked with P. J. G. Hodenpyl. Later he began to work for himself starting with a window in John Perry's store where hats and caps were sold. Later he moved to George F. Owen's music store. In 1870 he opened his own jewelry store with a modest stock and a repair bench at 25 Monroe. 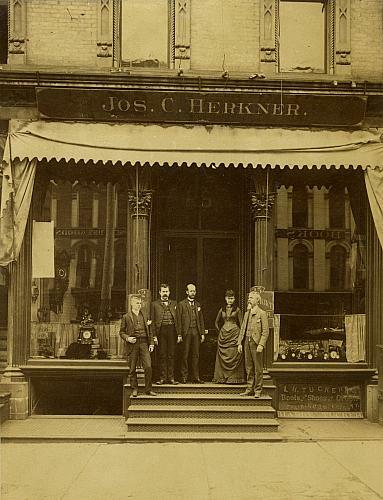 Herkner stands on the steps in front of the store; at his right is his daughter, Elizabeth, his only surviving child. Herkner’s interest in the military continued after the war, and in 1872 he organized Company B of the local militia and served as its captain. He never served in public office but was active in many areas of Grand Rapids life. For years his store had a large optical department in addition to jewelry, watches, fine china and silver. Residents considered Herkner's the epitome of quality. He died in 1914 and is buried in Fulton St. Cemetery with the members of his family. Civil War soldiers are greeted with a lavish banquet upon their return to Grand Rapids. Sligh, Charles R. History of the Services of the First Regiment Michigan Engineers and Mechanics During the Civil War, 1861-1865. Grand Rapids: 1921. Hoffman, Mark. “My Brave Mechanics": The First Michigan Engineers and Their Civil War. Detroit: Wayne State University Press, 2007.